More than 200 people have been killed in a brutal surprise offensive by Islamic State in Syria that involved multiple suicide bombings and simultaneous raids in which militants stormed villages and slaughtered civilians. The attacks on Wednesday targeted the city of Sweida and nearby towns and villages in south-western Syria – areas that before the war were populated mostly by members of the Druze minority sect, and that are nominally under government control but have largely stayed out of the fighting that devastated much of the country over the last seven years. The director of health for the surrounding Sweida province told the pro-government Sham FM that 215 people had been killed in the attack. Earlier, the Syrian Observatory for Human Rights, a war monitor, said the death toll had reached at least 156 people, and local journalists said the number was at least 175. The militants are also believed to have kidnapped dozens of people and taken them back to their hideouts. Local sources said the attacks began almost simultaneously in the early hours of Wednesday, between 3.50am and 4.30am. Isis claimed responsibility for the offensive, which developed into armed clashes with local militiamen. The terror group also launched two suicide attacks on the provincial capital, also called Sweida. Syrian state media said government forces killed two suicide bombers before they were able to detonate their vests. The offensive was one of the deadliest in Sweida and government-controlled areas in recent months. 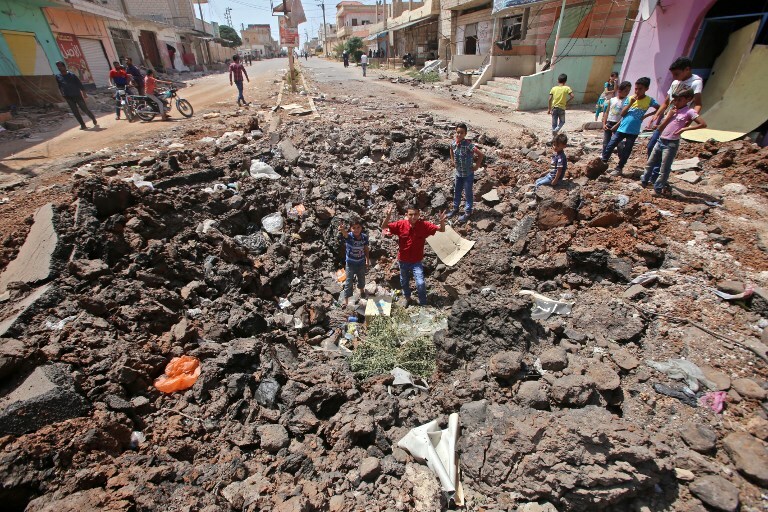 It occurred as the government of Bashar al-Assad continued to wage a campaign in the neighboring province of Daraa to reclaim control over all of southern Syria. Isis still controls a sliver of territory in Daraa in the Yarmouk river valley, near the border with the Israeli-occupied Golan Heights. The area has been the target of unrelenting airstrikes over the past few days to force the militants’ surrender. The fighters who carried out the attacks may have emerged from Isis-controlled territory in Syria’s eastern desert, where more fighters arrived in May from the southern suburbs of Damascus after a government offensive that forced their surrender. The militants, who once controlled nearly half of Syria’s landmass in 2015, have seen the territory under their command shrink under concerted campaigns by the US-led coalition and Syrian government forces over the last year. But they still pose a potent danger through isolated attacks and occasional coordinated raids as they continue to conduct an insurgency from their remaining hideouts. The SOHR said government forces had battled jihadis who stormed the villages from an Isis pocket north-east of the city. Government troops and allied forces hold all of Sweida province except for that enclave. The air force pounded militant hideouts north-east of the city, state media said, adding that calm had mostly prevailed in the area, but fears remained that the militants might launch follow-up raids. The UN’s humanitarian coordinator in Syria condemned the attack, saying civilians and civilian infrastructure must be protected and spared “the brunt of violence and conflict wherever they are”.